Colour is at the front and centre of the features most likely to have an impact in your kitchen design scheme. On a par with the style of your kitchen, the colour you choose sets the tone for the entire space. Natural wood and white are always the most popular choices, because of their neutrality, but there is also a growing trend for coloured, painted kitchens. Vintage blues and greens are growing in popularity and you can now get kitchens in practically every shade of grey imaginable. Colour can change the whole feel of a kitchen. Take, for example, the Harvard range from Daval: a Shaker style kitchen that comes in a range of colours and finishes. In Light Oak or Mandal Maple it creates a traditional, farmhouse kitchen feel. In Ontario Walnut the effect is much more modern. In Fjord, a blue-toned slate grey, or Dove Grey it’s more of a vintage style and Porcelain Nature or Frost White give it a neutrality that offers a blank canvas for splashbacks and wall coverings. Charcoal adds drama. Colour, therefore can give a simple kitchen chameleon-like properties, making it an extremely important decision. 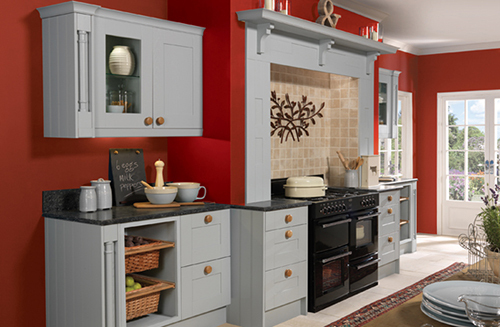 Colour is often the starting point when planning a kitchen project. Sometimes people know that they want a grey kitchen (for example) but they’re not sure what style of door it will work best in. That’s why we added our Kitchens by Colour feature on the website. Image galleries such as these on websites and colour swatches on brochures can give you a decent idea of the range of colours available but the best way to make a judgement is to see them in your own kitchen, in the unique light properties that you have there – computer screens, print or even seeing them in a showroom can never give you a true representation. When we come out for design consultations, we always bring colour samples and even door samples with us so you can do just that. It helps if you can give us an idea about what sort of colours you’re considering before we come as we can’t carry everything but we will bring a selection. You can also pick samples up in the Daval showroom in Huddersfield. When choosing your colour, have a think about the scheme as a whole: what other decoration do you want to team with it? ; if you want colour, should that be the kitchen itself or the wall coverings or splashbacks? ; are you aiming for a theme or style and what colour would best achieve that? ; even practical considerations such as how often would you want to be cleaning down light coloured doors?! Unless you are very single minded and know exactly what you want then you need to give these questions and others careful considerations. We can definitely help, whether it’s referring to our brochure or Kitchens by Colours, our planning guide or getting us out to your home to do a design consultation, it’s part of our role to guide you through this. If you would like a design consultation ring us on 0800 321 3491 or request an appointment here. 0 Responses to "Kitchen Trends Monthly Blog – July"